The Wright Stuff: First Grade! 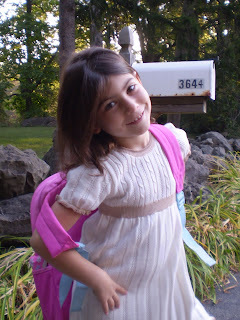 Well, my little girl is officially a first grader now. There was a little confusion about the bus this morning. It came on the wrong side of the street. But that means she gets to wait with the girl from across the street, so that will be fun. Also, it turns out that many of her old friends are on the same bus. Genevieve seemed very happy when I picked her up. The Y after-school program seemed good. She said "everyone is so friendly here!" I asked her what they did in school today. "So many things I can't even remember them... We had free choice time! And snack!" During "star time" she found a book with a picture of a hamster who looks "just like" Prince. Music was apparently her favorite activity. That's not surprising considering she loved it last year, and these days she goes around singing constantly. I am hopeful that it's going to be a good year!